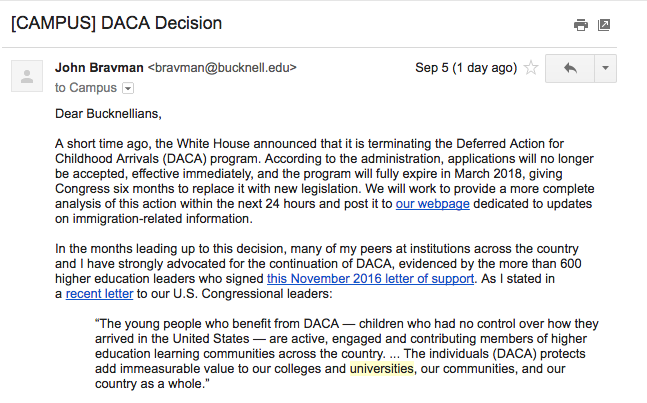 Yesterday morning, John Bravman, President of Bucknell University, sent an email to Bucknell students and faculty, rejecting the termination of DACA. Deferred Action For Childhood Arrivals is a U.S. immigration policy, passed under the Obama Administration, allowing undocumented immigrants who entered the U.S. as minors deferred deportation, as well as a chance to get a work permit to stay in the U.S.
His email contained a review of privacy laws under FERPA, which apply to all students, both documented and undocumented. 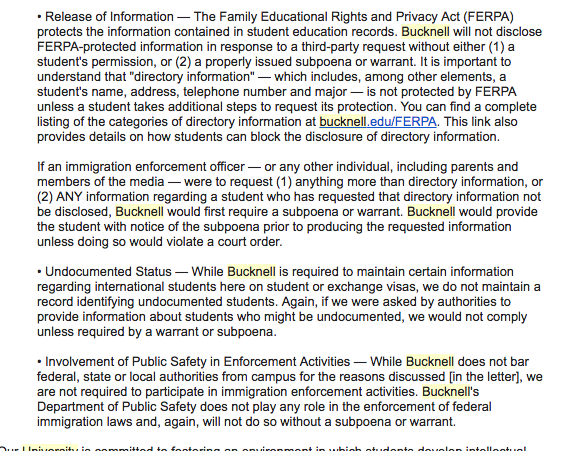 FERPA states that no information about any students may be disclosed to any law enforcement officials without a warrant. He followed the FERPA laws with a statement of support for all students on campus.